Our school year program run from September to November as part of our Fall Program and from February to June as part of our Spring Program. We offer a variety of age-appropriate programs that can be customized to fit within any curriculum or specific group’s needs. SEACAMP San Diego prides itself on program flexibility – our Marine Science Instructors can tailor labs and activities to your group’s level and interests. Schedules incorporate the wide range of studies within marine science, scientific research, and many hands-on field activities. It is SEACAMP’s goal to supplement traditional marine biology classroom study by providing a hands-on marine science education program to students of all ages. 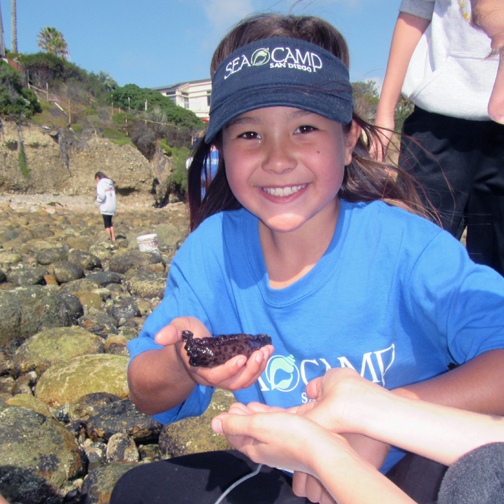 SEACAMP provides students with an opportunity to examine the various areas of marine science through study both in the classroom and the natural environment. Students not only learn specific information in fields including physical oceanography, marine biology, ecology, and physiology, but also have the opportunity to learn about the research process and career opportunities in these fields. Lab instruction is combined with field study including but definitely not limited to snorkeling, kayaking, a boat trip, tidepool exploration, and much more. These classroom, lab, workshop, and hands-on outdoor education experiences will enrich not only their scientific knowledge but also their powers of observation, their critical thinking skills, and their ability to take on challenges and try new things! Students will be housed in a traditional open style dorm equipped with bunk beds. We have two large dorm rooms, one for female students and one for male students. Students are assured 24-hour supervision by our SEACAMP Marine Science Instructors that spend the night in the dorms with the students. Students bring their own bottom sheets, sleeping bags and pillows. Adults staying onsite will be housed in the dorms with the students. Dorms are separated by a courtyard area, which encloses a safe space to play games and hang out, and provides a sunlit outdoor area for the tables for meals or alternate lab space. Bathrooms are across the courtyard with separate facilities for males and females. Each bathroom is equipped with toilet facilities and separate curtained showers. Students and SEACAMP San Diego staff members travel to the tidepools during a daytime low tide. Here, the students learn the basics of tides and the stresses of intertidal life. Students are then allowed to explore the intertidal zone and collect specimens in buckets. At the end of their exploration, students are brought together to identify and discuss the specimens collected. An emphasis is placed on adaptations for intertidal living and conservation. All animals are returned at the end of the session. Students are instructed on the fundamentals of kayaking, fitted for gear and then embark on a kayak excursion on SEACAMP’s tandem, sit-on-top kayaks. From the kayaks, students may observe a wide variety of local animals including birds, invertebrates, fish and algae. This activity takes place on Mission Bay and may include a discussion of shallow bay ecology or a plankton tow. This activity is usually paired with snorkeling or kayaking at Mission Bay. From the beach, students are taught to work a long collecting net called a “common-sense” seine and attempt to catch some local, inshore marine life. Once caught, specimens are placed in buckets and instructors teach about them and their habitat. All animals are returned at the end of the session. Students and SEACAMP San Diego staff members travel to Kellogg Park at La Jolla Shores. Here, they are taught the basics of boogie boarding and the science of tides, waves and currents. After students suit up in the provided wetsuits, they get in the water to perform activities that help demonstrate these oceanographic processes. Afterwards, students are allowed to experience the waves of La Jolla while boogie boarding under the supervision of the SEACAMP San Diego staff. 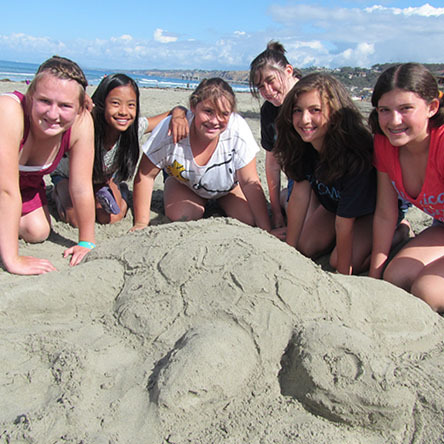 For larger groups, students rotate between boogie boarding and a beach walk where they are taken along the shore to examine a variety of plants and animals, and participate in instructive games. Students and SEACAMP staff members board a charter research boat for a cruise on San Diego’s Mission Bay. After a safety orientation, the vessel heads out of the bay into the Pacific Ocean for a feel of the ocean waves, a sampling of some giant kelp and possibly a sighting of dolphins and sea lions. Seasonally, we may also cruise around in search of California gray whales. On the way back into the bay, staff members discuss the giant kelp and the ecology of the kelp forest. Once back in the bay, staff members deploy and retrieve a trawl net with the help of the students. Each species of animal collected is displayed and discussed by the SEACAMP San Diego staff. Next, the students are broken up into smaller groups and rotate around the boat to several stations that include plankton collection, plankton evaluation, physical oceanography, mud sampling and examination of trawl animals. On the way back to the dock, the trawl animals are released and some birds and marine mammals of the bay may be observed. Students learn the basics of snorkeling and free diving during snorkel sessions throughout the programs. Students of all abilities have been very successful in mastering the skills of snorkeling through our progressive and well-supervised snorkeling program. Snorkeling activities include an introductory session at Mission Point. This part of Mission Bay has an easy beach entry and several shallow-water environments that are teeming with life. After snorkeling, many groups will participate in the seining activity (see seining section above). Some schedules will also include a SCUBA demonstration in which students learn the parts of the SCUBA unit and the basics of SCUBA diving. Students will then get an opportunity to practice breathing in the SCUBA regulator in shallow water, one-on-one with a SEACAMP instructor. Students 7th grade and older have an opportunity to participate in an all-day boat excursion aboard a 65-foot charter boat. After a safety orientation the vessel heads out of the bay into the Pacific Ocean for a feel of the ocean waves, a sampling of some giant kelp and possibly a sighting of dolphins and sea lions. Seasonally, we may also cruise around in search of California gray whales. During the trip, staff members deploy and retrieve a trawl net with the help of the students. Each species of animal collected is displayed and discussed by the SEACAMP San Diego staff. Additionally, students are able to participate in a snorkeling excursion from the boat. 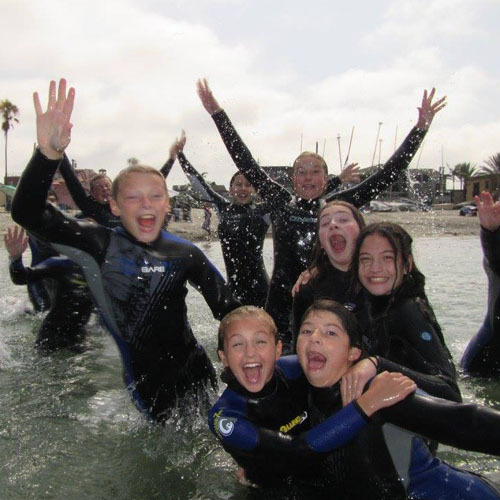 SEACAMP San Diego has been extremely successful taking students of all abilities snorkeling since 1987. All SEACAMP San Diego staff members are certified Lifeguards and extremely comfortable in the water. Students and staff wear thick (7mm) wetsuits which provide a maximum amount of warmth as well as buoyancy. (In other words, the wetsuits make the students float!) Additionally we keep our student to staff ratios very low (no more than 7:1 for snorkeling) and our staff members carry buoyant rescue tubes with them in the water. Our marine biologist instructors lead students in small groups; the focus of each snorkel session is to learn about the area’s particular ecosystem (kelp forest ecology, bay ecology, etc.) and the specific animals found within it. Instructors and students may even pick up certain animals for a ‘hands-on’ discussion. This lab provides students a general overview of marine life diversity. Topics may include plankton, algae, invertebrates, fish, and marine mammals. Students encounter live specimens and handle unique artifacts to supplement the lecture. Particular emphasis can be placed on organisms likely to be seen during the SEACAMP visit. Students learn fish anatomy and behavior. They observe and discuss adaptations that allow fish to flourish in specific environments, and explore the differences between the three different classes of fish: Agnatha, Chondrichthyes and Osteichthyes. 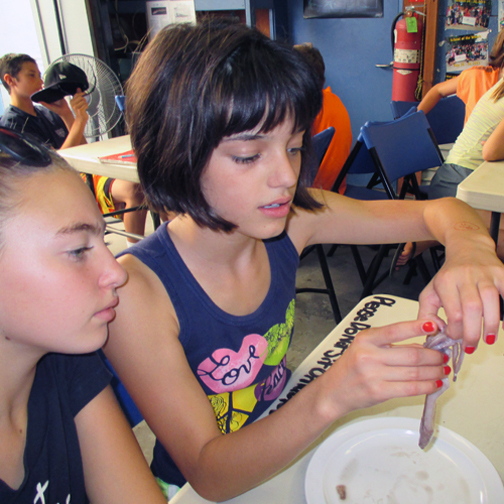 Students examine preserved specimens and/or participate in a dissection of a Pacific mackerel. Particular emphasis can be placed on fish likely to be seen while snorkeling during the SEACAMP visit. In this lab, students explore the importance of local marine invertebrates. Using live specimens, students investigate the differences in several invertebrate phyla, including Arthropoda, Mollusca, and Echinodermata. The lab generally concludes with a study of the external and internal anatomy of a market squid, through dissection. Particular emphasis can be placed on invertebrates likely to be seen during the SEACAMP visit. In this in-depth investigation of sharks in class Chondrichthyes, students learn the importance of sharks in marine ecosystems, as well as their senses and stresses. Live specimens from our on-site shark tank might be used for observations. The lab may conclude with information on shark conservation and research. A shark dissection may be done when specimens are available. Local school groups can bus to camp or use parent drivers. We are also sometimes able to pick-up students from school at an additional cost. However, this is dependent upon van and staff availability. Non-local, overnight school groups can either fly or bus to camp. Arrival and departure times must fall inside the window of time given at confirmation. Flights will arrive into San Diego International airport where SEACAMP staff members will meet and transport you to our facility. SEACAMP San Diego is located 15 minutes from the San Diego Airport. Transportation to and from the airport is included in SEACAMP tuition. If applicable to your program at SEACAMP, students and adults will be transported to and from activities in our 15 passenger vans. SEACAMP San Diego Marine Science Instructors possess at least a college degree and are certified Red Cross Lifeguards with First Aid and CPR for the Professional Rescuer – including training and first aid for marine hazards. Additionally, all staff have been finger printed with the Department of Justice & FBI and all have Class-C commercial driver’s licenses. SEACAMP San Diego does not retain a nurse on staff, although we do have a paramedic consultant on call. We are within close proximity of emergency care and are in a 9-1-1 service area. See Our New York Times Article!